My Bluehost renewal is coming up soon and I’m really debating cancelling it. It’s like $8/month, but with my email going directly to Gmail now, this dumb blog is the only thing of note at evanhoffman.com, and I can move that anywhere. I already copied all the content to another server but I can’t find free DNS hosting anywhere. Maybe i’ll just run my own nameserver. This is the second time this has happened: All the wifi devices in my house lose their connection to the FiOS router/access point (ActionTec MI424WR-GEN2). I checked my wired desktop and it wasn’t able to get an IP from the DHCP server (the router). The “Internet” light on the router was out. I unplugged the router and plugged it back in and it came back up fine. But this happened about a month ago too – I wonder if it’s a monthly thing? Either way, it’s annoying. Other than this, the internet service is phenomenal still. 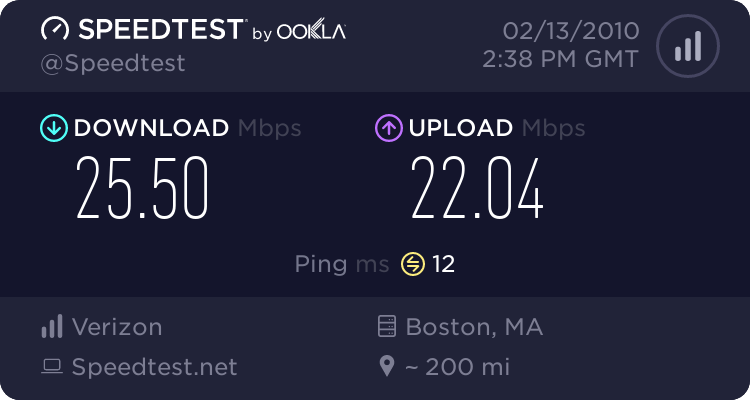 So I got my second FiOS bill a couple of weeks ago. After the issue with my first bill was straightened out I ended up paying about $43 for the first 6 weeks of service. Well, my second bill was about $90, but applied a $180 credit on my account, so the bill showed -$91. So basically the first 3 months of service will end up costing me about $43. Even if it comes to $90/month for the remainder of the contract, this is such a huge savings that I don’t see how Cablevision could match it.